Radios in 2019 can be boring and too old school for some people but there are some people who have a sincere love for radios. You landing up here means you are one of them, right? It is a time when even radios have so many styles, varieties and options to choose from that it becomes overwhelming to some extent. Be it for your own home, for your garage working time or a gift for some fellow radio lovers, there are just so many options to choose from. The task gets a little more hectic when you have to compare radios in a similar price range with different kind of features. It’s a fact that everyone loves a product that is value for money. So, in order to decide what’s the best for us in the best possible price that we go on a deep research on the product. Studying its features, comparing the price with other radios, its pros and cons and many other things are included in our research. So what if we provide all the necessary details that you need to know about your favorite product on a single page itself? Wouldn’t it be so much better? Well, that’s good news because this post is exactly for the same purpose. In this post, we have included the product description, features, pros & cons, faqs, and customer reviews. That’s basically everything that is needed to know all about a product. Just keep reading to know all about it and we promise it will make your job easier on deciding what radio to buy. Let us just start with the brief description of the product so that you know whether it is for you or not and that you wish to read more about it or not. It runs on 12 Volts, 18 Volts, and 20 Volts MAX battery packs. AC and DC powers which allow the flexibility to run on AC power or DEWALT power tool battery. It includes a device storage box which keeps the device same from debris and damage. With the help of USB power port, you can charge the device via USB when the radio is connected to an AC source/outlet on the wall. With the 3.5mm aux you can easily connect the radio to any audio device, be it MP3, CD or portable satellite receiver. Lithium-Ion battery cell- 20V being the max initial battery voltage while the nominal battery voltage is 18 volts. A trustworthy warranty of 3 years is also given by DeWALT. 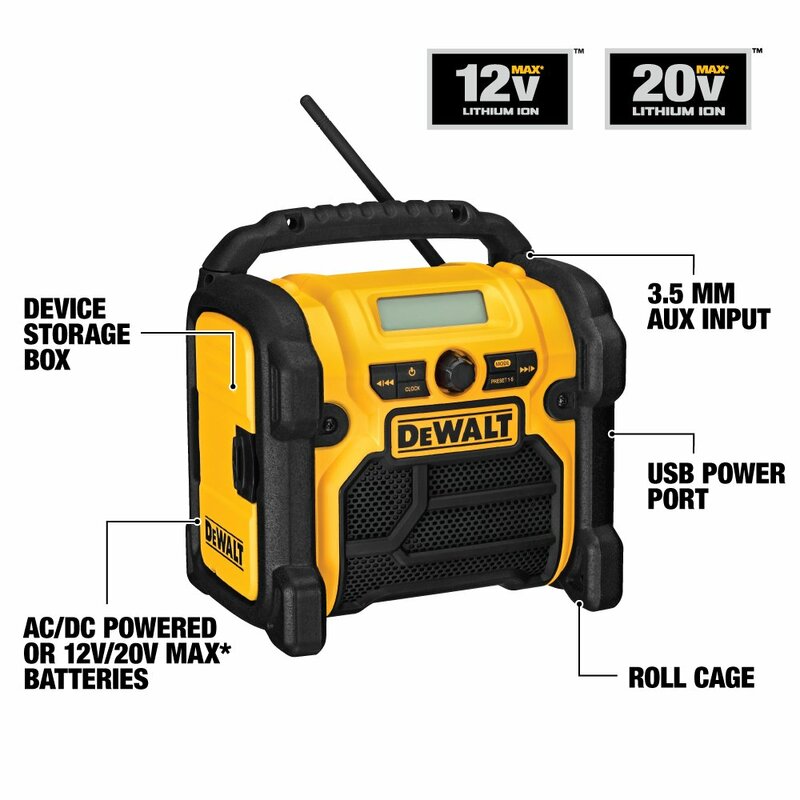 2 DeWALT Max Li-Ion batteries ranging from 12 Volts to 20 Volts are charged simultaneously. Charging compatible devices is also made easier with two USB ports. Max output=1.5 Amp. LED battery indicator confirms the battery status when the battery is charging and when it is fully charged, also indicated about when its time to replace battery pack or when the battery is too hot or too cold. Battery gets fully charged in just 90 minutes is pretty helpful when you are in any hurry The battery is drained even if its kept ideally. The lithium-ion battery will ensure minimal downtime. The adapter is very tight and difficult to remove especially if it runs our while you are working and have your gloves on. A USB port to charge other devices such as your phone comes in handy. The device falls on the lower side in case of battery life. Is the adapter continously draining the battery even while it’s sitting idle on the shelf or not being used? Answer: Yes, the battery drains to some extent while it is sitting on a shelf and not even being used. But that doesn’t mean it will drain completely overnight. Though we suggest you remove the batteries when it is not to be used for a longer duration of time like when you are leaving for someplace or while sleeping at night. Is it possible to charge a 20Volts battery when it is plugged into an AC source such as the wall outlet? Answer: No, plugging into the wall AC outlet will not charge the battery but the only thing that will happen on doing so is that it will run the radio using the AC power source and not the battery. Dewalt should have come out with the idea of this kit many years ago. PERIOD. But Thank God they did it anyway, It has helped me so much and made my so much tasks easier. Works perfectly fine with all of my 18 Volt tools. Bet it any drill,circular or reciprocating saw, and even grinder. A great tool if you are a DIYER, which basically means it will help you with all of the tasks that you do when you like to make or build things on your own and the best thing is that even if I forget to charge it at night I plug it in upon waking up and while getting ready(which takes me about 60 minutes) and it is charged enough to last almost entire the day. Loved this product and every penny spent on it was definitely worth the investment. All in all this product is quite popular and there is a reason for it. 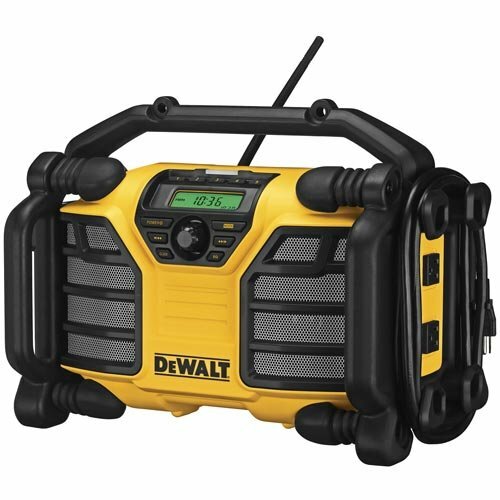 It stands well on the name of DeWALT because of its strong build quality and durability. 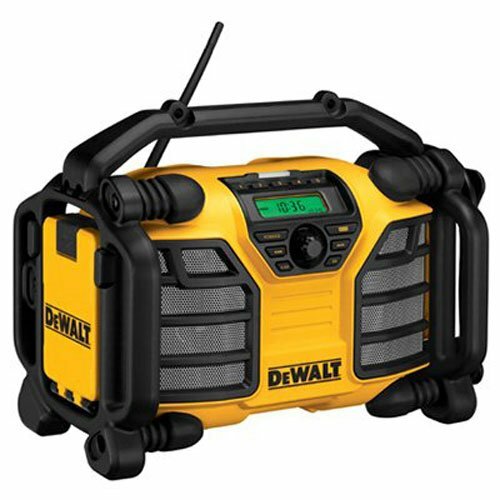 All of its features work amazingly well as promised by the company and with only minor drawbacks, this product by DeWALT is pretty impressive.